Laurence Krauss makes the allegation that Larry Taunton, an unknown entity, is using Christopher Hitchens to ride his coattails to make money. I did an experiment that you can easily duplicate. Google "Taunton." Most of what shows up is about the town. Larry Taunton did not appear in the first 50 entries. Google "Hitchens." First appears Christopher, second Peter, and not far behind, on their coattails, Larry Taunton! 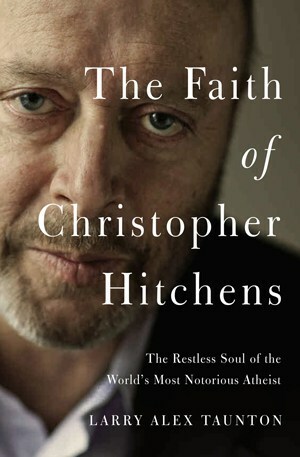 This review is kinder, it attributes this caricature of Christopher Hitchens to Taunton's evangelical agenda. To write an Amazon review you first have to pick a number of stars to rate the book, from one to five. Reading the first part of the book I thought it deserved one star, less if there were a zero option. I had highlighted over thirty passages that distort Christopher Hitchens to the point of making him look like he was just a few steps from becoming a born again Christian. Past the mid point, the book changes in tone to the point that I wondered if it had been written at a different time. Now there were fewer passages to highlight and what appeared to be the real message began to shine through. It seems that the purpose of the beginning of the book was to reduce Hitchens' stature to a size that Taunton could manage. Lest you think I'm being fanciful, this is the self admitted tactic Taunton used to debate Hitchens in Billings, Montana. "He is a formidable and much more experienced debater than myself. An Oxford pedigree; a bestselling author; a celebrated public intellectual; all of which are complemented by a marvelous aristocratic English accent, and that always adds a few IQ points in the minds of Americans..." This got some laughter. "As for me, I'm just a boy from Alabama..."
Christopher was having none of it. Popping up to the lectern, he responded to this immediately. "Well, thank you, Mr. Chairman. I thank you, Larry. Thank you, Larry, above all for, how shall I put it, lowballing this evening's contest?" He smiled. "If only by phrasing it as a contest between an overpromoted, Oxonian elitist and a mere hick from 'Bama." Taunton's book is not a great literary work and it does not achieve the author's purpose of demonstrating that Christopher Hitchens was on the point of conversion so it does not deserve five stars. Despite it's shortcomings, this book makes you think even if it is only to write a fair review. Giving a book a single star because you disagree with the author is a mistake in my opinion, what is under review is not the author but the book. In any case Christopher Hitchens himself seems to have respected Taunton if for nothing else for his sincerity. It is only fair to state my own position before diving into the book itself. Taunton states that he has never met an atheist who didn't claim to be one for logical reasons. A cult is usually handed down from generation to generation. It took me several decades of study to become an atheist, and the study was prompted by the events I was witnessing since WWII. My starting point was determining if god existed. At that point the only god I knew about was the Judeo-Christian one. Since there is such a close relation between god and religion I began by studying the world's religions. "Atheism" is an unfortunate term. All it means is a lack of evidence for the existence of a real god. I say "real" because clearly god as a concept pervades civilization. This god is a figment of our imagination like the Tooth Fairy and Santa Claus. There is nothing to be feared about this imaginary god. We can cut short the discussion by simply asking for proof of the existence of a real god. No one has yet to present such a proof. Tilting at this imaginary creature is as useless as Don Quijote tilting at windmills. If god is not the problem with religion, then what is? The clergy! "Religion in the wild," as Dan Dennett calls it, had some benefits for early civilization as otherwise it would not have developed and survived. But in time religion became a political force used and abused by the clergy. That religion is a political tool can be deduced from doctrines like the Divine Right of Kings, from rulers from antiquity to modern times declaring themselves gods, and from Emperor Constantine adopting Christianity as the official religion of Rome. People preaching the spirituality of religion are either deluded or frauds as Christopher Hitchens often pointed out while forgiving honestly deluded believers. In the same vein, religion has produced some wonderful texts and teachings but that does not make it the arbiter of morality. As I noted above, the first half of the book is dedicated to taking Christopher Hitchens down a peg or two to Taunton's level. Although I took copious notes, I'll just use the first one. Taunton writes "No, Eric's chief deficiency as a father was his excessive tolerance of a son who did not honor him as a son should honor his father." This is Taunton taking a swipe at Christopher while seemingly criticizing his father and the argument he uses comes straight out of the Ten Commandments. I have no objection to honoring parents who merit that honor but with so many single mothers one has to wonder if the missing fathers or the aborting mothers deserve honoring. To follow the Ten Commandments blindly one has to suspend judgement. This example illustrates Tauton's attack strategy and his biblical perspective. Additional illustrations from the first half of the book would be repetitious. The second half of the book uses a different strategy. Taunton claims that Hitchens's "friendship" and his dedication to studying the bible together are indications of Hitchens's assured redemption and conversion being only a matter of time. The claim is absurd and self serving. Moshe Dayan wrote a book about desert warfare. After the Six Day War Dayan said he was glad the Egyptian high command had not read his book, Israel might have lost the war had the Egyptians know what he was up to. An atheist can be content with saying that he has never seen reasonable proof of the existence of god. But Christopher Hitchens was more than an atheist, he was an anti-theist. Christopher was waging war on the absurdities and evils of theism and the only way to know them intimately is by studying them. When I started my journey I wanted to find proof of the existence of god. How could I find that proof but by studying related topics with an open mind. My journey took several decades. As my studies advanced my mindset evolved until I arrived at a decisive conclusion. There was no other way than through the study of what became clear was the enemy of humanity. As for friendship, Christopher was incredibly open minded. For example, in the Israel-Palestine issue most people take strident partisan sides. Not so Christopher who gives each its due and criticizes each for its faults. Christopher's openness and fairness combined with his doggedness is what made him such a great critic. To mistake friendship with conversion is to underestimate Christopher Hitchens. Of the so called "Four Horsemen" Christopher Hitchens is a head and shoulders above the others. Had Christopher shown any signs of belief in the supernatural, we atheists would have to take a very careful look at his motives and reasons. What Taunton claims about Christopher is nothing but the wishful thinking or misrepresentation of a Christian Evangelist. There is one more note that is worth commenting on. Taunton misunderstands or misrepresents the reasons why Southern Christians flocked to hear Christopher speak. It never occurs to Taunton that these Christians might be closet atheist looking for an opportunity to come out. Christopher's speaking engagements certainly were safe venues for them to hear about atheism in places where there were no other such venues.